I replied to him that I felt his fish oil capsules were way too low in DHA. 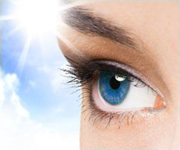 Here is my advice for selecting a DHA or Omega-3 supplement for the eyes. First, select a product that you are 100% sure contains non-rancid oil and is free of pollutants – that’s the most important criteria for selecting a brand of fish oil. Don’t expect it to be easy to determine freshness and purity because everyone tends to make misleading claims for their products. I can’t give you a simple answer – unless you want to take the exact same products I have decided to use for myself. I try to maximize the amount of DHA (or the DHA to EPA ratio). I look for products high in antioxidants (this is synergistic with the freshness criteria too). I look for superfood products rather than designer-type supplements. I'm not usually impressed by the patented and/or trademarked versions of nutrients, particularly when those ingredients are more pharmaceutical than food. Many new "nutraceutical" supplements are too close to the pharmaceutical mind-set for me to be comfortable taking such products every day. The more refined the nutrient, the more clinical research studies I want to read before taking it - and the longer I want to wait before deciding such a nutraceutical is safe. I use Blue Pasture's Cod Liver Oil liquid (not capsules). It is packed in air-free bottles to ensure freshness. Many people might consider this product to be too low in DHA compared to EPA. I use it because it is a “super food” rather than a vitamin supplement. And the DHA to EPA ratio is about 1:1, which is much better than many fish oil supplements. I’m also using Neuromins DHA. This is one of those patented nutrients that I am usually wary of. However, after some research, I felt Neuromins was an excellent option for DHA from the perspective of purity and freshness. There are too many questions about the purity of fish oil products (due to pollution and rancidity) for me to be comfortable with the usual options. That's why, in this case, I went with a laboratory-created product. "The DHA supplement we recommend is Neuromins®, a pure form of DHA derived from seaweed. This is the exact source fish get their DHA from. Neuromins® is derived from an all-natural plant source, which makes it a very pure and safe form of DHA. Neuromins® DHA has been evaluated by an independent panel of experts and found to be Generally Recognized As Safe (GRAS) for use by adults (including pregnant and lactating women). In fact, unlike DHA from fish oil, Neuromins® DHA is considered so safe and so important for brain and eye development, it is added to infant formulas in over 60 countries but not yet in the U.S."
As you may notice, I don't take a single "fish oil" product. I just don't think they are safe. I take similar products and I get all the benefits -- and more -- that I would get from fish oil. But you won't catch me taking fish oil (pardon the pun).